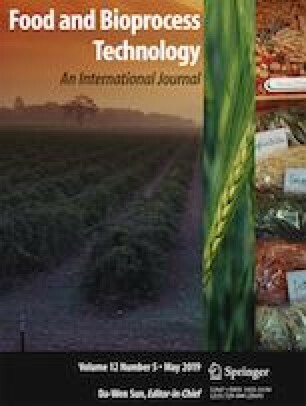 In this study, the potential of flaxseed mucilage nanofiber, as wall material, for encapsulation of flaxseed oil (FO) was investigated. Four series of O/W emulsions at different ratios of FO (0, 10, 20, and 40% w/w) were used to fabricate FO-loaded nanofibers and encapsulation efficiency (EE), loading capacity (LC), and the nanofiber morphology was investigated. Finally, the oxidative stability of entrapped oil as well as bulk FO was investigated during storage by measuring peroxide value (PV), thiobarbituric acid-reactive substances (TBARS), and totox value. The chemical structure and thermal properties of the nanofiber and oxidative stability of loaded FO were also evaluated on the selected best ratio. The highest LC (23.6%) was obtained in nanofiber containing 40% (w/w) FO which had uniform morphology with an average diameter of 332.9 nm. In regard to oxidation tests, PV of encapsulated FO increased from 8.1 to 25.5 meq O2/kg while for bulk oil, the value elevated from 1.4 to 25.5 meq O2/kg during 14 days. Moreover, TBA of protected FO increased to 78.49 mg/kg oil while in control sample, the index reached at 107.3 mg/kg oil. The results of oxidation test demonstrated that the nanofiber was successful to improve the oxidative stability of flaxseed oil.